To attack a stadium is to attack not just people but the ideas of magic and escape in a difficult world. 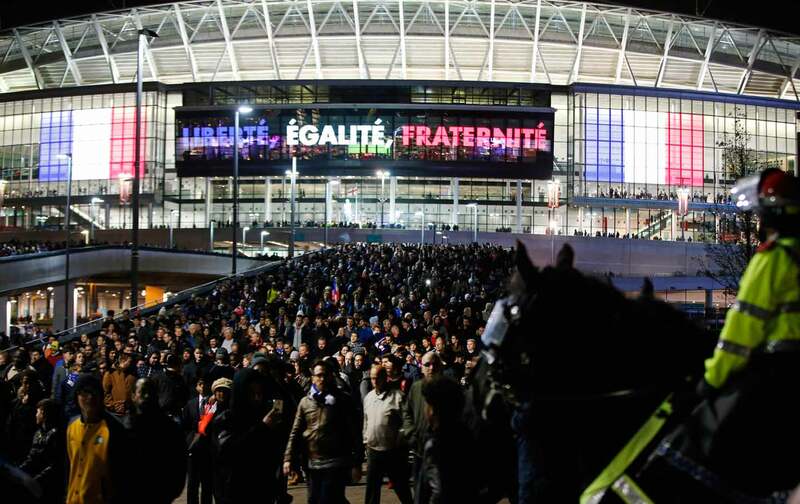 The terrorist attempt to enter the French National Stadium and kill thousands of innocent people was barbaric, contemptible, and absent of any humanity. But it wasn’t original. The shocking cruelty of attacking the crowded space where a multicultural, multiracial French national team won the 1998 World Cup doesn’t make it any less derivative. Sports arenas have long been attractive targets for terrorists to wage the kind of psychological war that carries an impact beyond a body count. Stadiums swirl with connectivity, magic, and memories. At their worst, these memories are soaked in self-made smoothies of vomit and cheap beer and the only connections are between your wallet and the nearest cash register. “Magic” means getting out of the parking lot in less than an hour. It’s overpriced and gross, but usually with time and the right friends, a memory to be enjoyed all the same. But at their best, a stadium thrums with spectral vibrations containing every goal, basket, high five, and hug between strangers. You can feel a buzz, and when entering a new stadium absent of that history, you notice it. To stain a sports arena with blood is to attack the idea that there could be a communal space defined by frivolous fun. In dictator Augusto Pinochet’s Chile, the stadium was chosen very consciously as a place to gather dissidents to interrogate, torture and kill them. It was where the Chilean military mutilated the hands, in full view of a captive crowd, of legendary folksinger Victor Jara. The message from the US-backed dictator was that there was no such thing as a safe space. I once studied in Chile, and I interviewed people who made it out of the stadium alive, if not intact. They speak about their own country’s stadium with hollowed eyes. Free World Cup tickets wouldn’t draw them back. Pinochet holds no patent in converting a stadium into a concentration camp. The list of dictators who saw its dual use is as long as the 20th century. From the fascist leaders in the Europe of the 1930s to Syria, Afghanistan, and Libya in recent years, stadiums became synonymous with death. Then there are stadiums as targets of war. Palestine Stadium in Gaza City was bombed by the Israeli military on April 1, 2006, putting a crater at the heart of the 10,000 seat arena. FIFA attempted to rebuild the stadium after its investigation found that it was done “without any reason.” In November 2012, after six years of putting the stadium back together, it was bombed again by Israeli Defense Forces. This time the IDF claimed it was the site of missile launching. To attack and destroy this space, as I’ve argued before, is to attack hope. Today the psychological fear that fans are the new “soft targets” has inexorably altered the experience of going to a game. It is no longer something centered around kids and we grownups trying to forget our headaches and act like kids for a few hours. Now getting into a sports arenas is an experience only slightly less invasive than a colonoscopy. It means you and your children are getting patted down, having your bags checked, being wanded while bomb-sniffing dogs make their way up and down the lines. At one game, my kid tried to pet the dog and we almost ended up kicked out to the curb. This wasn’t a petting zoo, we were told. This was for his protection. But it wasn’t for him. And yet still we attend, with no stopping in sight. The $9 beers, the drunk fans, the knowledge that our tax dollars are paying for the enterprise have not stopped us. The trudging security lines that resemble a “First World Problem” version of a Soviet-era breadline won’t stop us either. The inconveniences for now are being are shunted aside as we hope against hope for a memory that will get us through the rest of the week. Yet finding those memories becomes more difficult as the real world encroaches on the sports world from all sides. The attackers and the protectors across the world have left these spaces disfigured, mangled, and scarred beyond what they were, with no evidence time will ever go backward. At some point we will need to decide whether to mourn their end or continue to try to breathe life into the ailing idea that there can ever again be a collective space to feel a collective joy.